Where I live we are in the depths of winter. 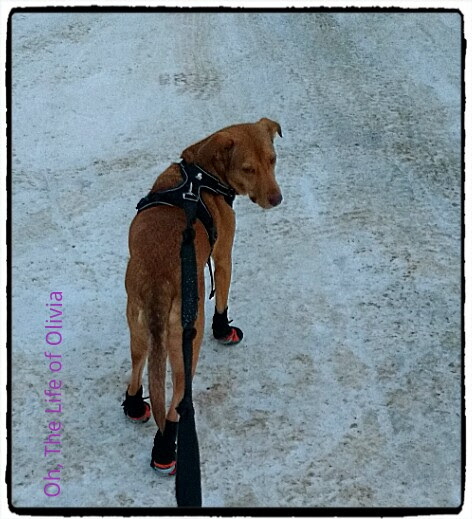 My huMom just got me a set of Canadian made winter boots from Critter Comfort & Clips. Why would a dog need boots? Simple, road salt & toxic road chemicals. So what is road salt? Mostly it’s sodium chloride, the same as table salt but road salt usually contains other chloride salts such as magnesium, calcium, & potassium chloride. Sodium acetate & calcium magnesium acetate may also be added to the mix, as well as some basic salts such as calcium hydroxide to help counter corrosives. It’s not good for our foot pads. Salt crystals can get between our toes & it burns. It can also dry out the skin to the point of cracking & bleeding. If we lick at a sore caused by road salt or just lick because we like the salty taste we can ingest too much salt which can lead to organ damage or death. Road salt is highly toxic. Booties will protect our feet but you may need to try more than one brand/style before finding one that fits properly. One type does not fit all. It may take your good dog a few minutes to adjust. It took me about half an hour of walking before I figured out how to walk in them 😉 . If you aren’t sporting a winter boot this season it’s very important for your human to wash off your feet once back home from the walk. A warm washcloth feels nice after the cold.